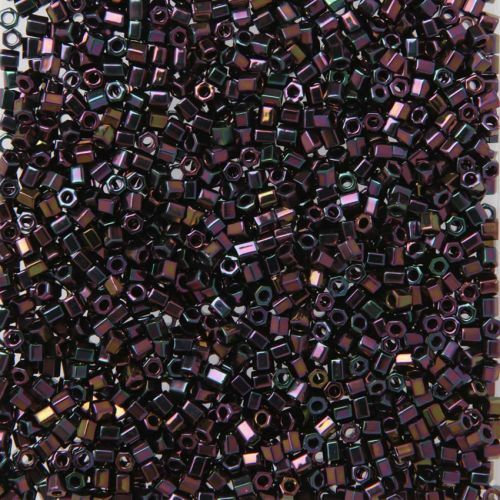 Instead of rounds, try hex beads such as these Toho size 8 hex seed beads in metallic iris purple. Hex seed beads are a great option for those who love to make seed bead jewellery pieces as they are a nice shape to work with, especially when making seed bead pieces on a jewellery loom. The beads have cuts on them that bring out their colour. These are size 8 hex seed beads, approx. 3mm. Threading hole measures approx. 1.5mm. These beads are sold in a bag weighing approx. 10g (approx. 485 beads). CommentColour is amazing, you don't see the full effect of the iridescence on the screen. CommentFab colour and ready to use for my bracelet. CommentEspectacular pieces! I will send you photos with the result!